Stretching the neck and shoulders. Lean against a doorway with one hand, lower your head, and try to reach your other shoulder with your chin, then return to neutral. Do 10 reps. Don’t try too hard: you are supposed to feel a pleasant warmth in the muscles. Then, repeat with the other arm. Relieving the pain and tension. Stand up against a wall so that the back of your neck touches the wall and your heels are 3 inches away from it. Lower your shoulders. Stretch your arms to the sides and do 10 lifts. The arms should touch the wall during this exercise. Improper positioning of the keyboard and the mouse and the habit of holding a smartphone all the time can lead to tingling and pain in the wrist. 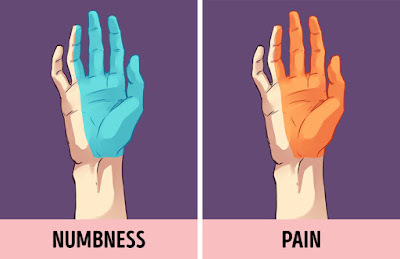 If you ignore these symptoms and these unpleasant sensations, you might end up with carpal tunnel syndrome. But there are exercises you can do to relieve the tension and prevent this disease before it starts. When you are in the office. 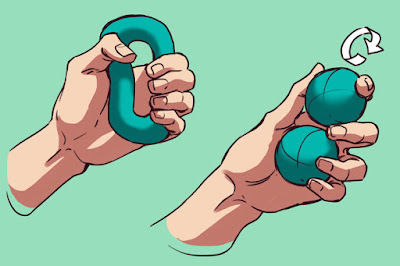 You will need 2 balls for your hands and an expander. Use the expander and the balls during the work day. This exercise will help your joints become stronger. Warm-up for the wrist. Take your own wrist and do 10 round motions with it, drawing circles with your hand while keeping your arm stable. Repeat on your other hand. Finger stretching. Begin by linking the index finger on your right hand with the index finger on your left hand, and pull. Do the same for all fingers on both hands. Exercise for the office. Sit on the edge of a chair and stretch one leg forward. Slowly bend your body toward the leg. Don’t overdo it: you are not supposed to feel pain or tension. Do 5-10 reps and repeat on the other leg. This stretching exercise will help you to relieve tension in the lower back and buttocks, and will relax the hamstring. Exercise for home. Lie on your back and put a pillow or a blanket under your neck. Bend your right knee and put your left ankle on top of it. The left foot should be just above the knee of the right leg. Clasp your hands around the back of the right thigh and pull. If you can’t put your hands around the thigh, use a towel. Don’t lift your buttocks and try to stay in this position for 20-30 seconds. Do 2 reps and then switch to the other leg.